Below are operating times, and rules for travelling through each of our locks. Generally, you can travel through a lock every day except for Christmas Day. Occasionally we have to close locks. Any lock closures will be listed on this page. 8am – 11.30 am, Australian Central Standard Time (ACST). 1pm – 4.30 pm, Australian Central Standard Time (ACST). 8am – 11.30am, Australian Eastern Standard Time (AEST). 1pm – 4.30pm, Australian Eastern Standard Time (AEST). 8am – 12.30am, Australian Central Standard Time (ACST). 1.30pm – 4.30pm, Australian Central Standard Time (ACST). To use a lock outside of normal operating times, you have to apply in advance. We need a minimum of seven days' notice. Please note you may also need to pay a fee. For more information, contact our Berri office on (08) 8595 2222. There are some simple rules for travelling through a lock. Wait until you see a red flashing light on top of the control boxes. This means the lock operator has acknowledged your request. The lock operator will prepare the lock for you. Do not approach until you are told to. Keep more than 150m back from the lock until you see a green flashing light. The lock operator will tell you where to stop in the lock chamber. They will pass down ropes so you can secure your vessel during the process. Navigating the lock with a vessel tied to the side of a houseboat is not recommended. Remember: If we feel conditions are not safe for lockage, we can refuse one. 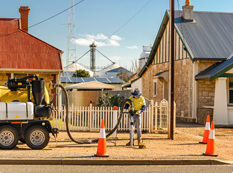 For more information, please contact our Berri office on 8595 2222. How can I contact SA Water staff at a lock or barrage? Locks work on a chamber system. To travel downstream, water inside the chamber must be at the same level as the top weir. If it isn't, the gates won't open. The top gates are opened by hydraulic-powered arms that allow the boat to enter. Once the boat is inside the chamber, the gates are closed behind the boat. Water in the lock is released by opening large, hydraulically-operated valves just upstream of the lock gates. Each valve is slightly smaller than an average house door. Water flows from the lock chamber through tunnels to the weir pool below. As the water level in the chamber drops, the boat is lowered with it, until equal to the level of the lower weir. Then, the bottom gates are opened and the boat passes through. 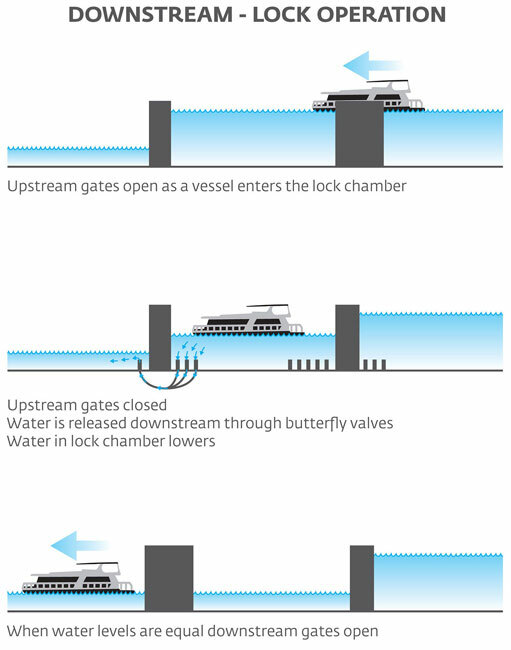 The water levels in locks are raised and lowered entirely by gravity: no pumps are used. This process is reversed for boats travelling upstream. It takes only about seven minutes to empty or fill a lock chamber. But, it normally takes 15 to 20 minutes to pass a boat through the lock. 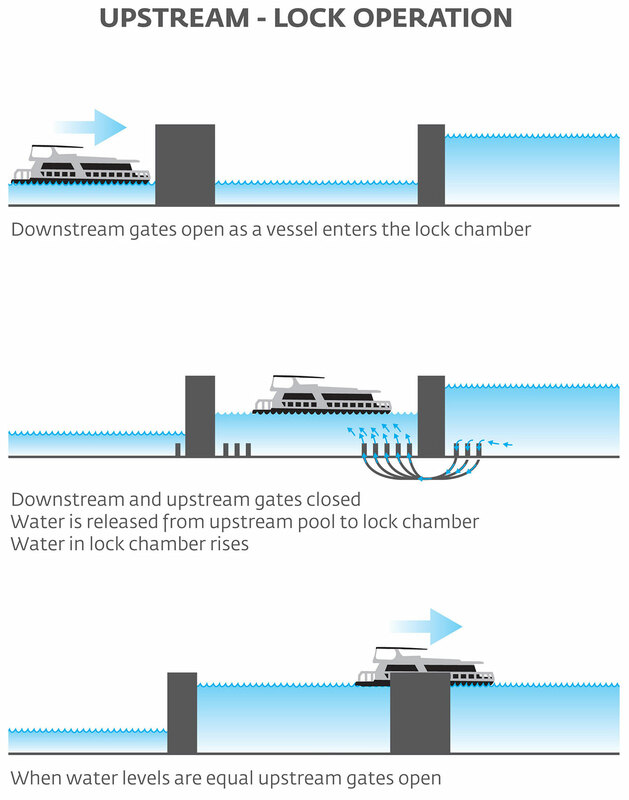 Each lock can take six to eight medium-sized houseboats at once.